1. Brush both sides of flat breads lightly with some of the oil. For a charcoal grill, place the flat breads on the rack of an uncovered grill directly over medium coals for 2 minutes or until golden. (For a gas grill, preheat grill. Reduce heat to medium. Add flat breads to grill rack. Cover and grill as above.) Remove from heat. 2. 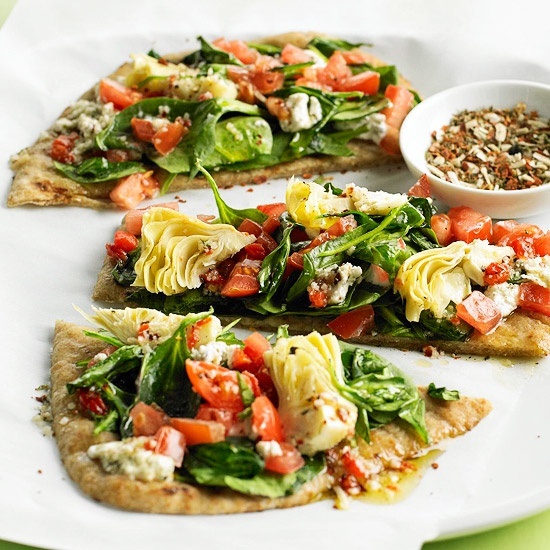 Top the grilled side of each flat bread with spinach, cheese, artichoke hearts, and tomato. Sprinkle with salt and pepper. Return to grill rack and grill about 2 minutes more until bottoms are browned and toppings are heated through. Top with pizza seasoning. Makes 4 servings.